Fancy challenging yourself and embarking on that demanding walk, climb, cycle, run or swim that you have always wanted to do? If so, Why not do it in aid of BTO and raise funds? It's a great motivator and will make the experience even more worthwhile knowing you are supporting work which will inform the conservation of Britain's birds. This summer we are part of Walk 4 Wildlife 2017 - so if you want to join an organised walking event, take a look here to see how to get involved and walk for wildlife. This summer a group of young wildlife enthusiasts, organised by James Common, editor in chief of New Nature – the youth nature magazine, will be tackling the Three Peaks Challenge and trekking 40km in order to raise money for our work on Curlews (read more in the New Nature article on pages 13-14). Together they are aiming to raise at least £500 and hopefully a lot more. If you would like to support their efforts, then take a look at their fundraising pages here, here and here. They are also looking for more people to take up the challenge, so if you are under the age of 30 and wish to join them then rachel.gostling [at] bto.org (subject: Three%20peaks%20challenge) (get in contact) and we can put you in touch. Georgia Locock's trekking 307km (191 miles) along the North West Way this summer to support the BTO's Swift tracking project. It's going to be 11 days of back to back walking and although 191 miles may seem a lot, it isn’t a smidge on the distance Swifts travel in their lifetime. You can support her on her justgiving page here. Justin Garner and Amy Carver cycled coast to coast from Southport to Hornsea covering 215 miles and raising £200. Despite problems with the weather, punctures and accidents they were determined to finish the challenge and did so in three days. Justin said 'it gave us a massive buzz when we arrived in the sea side town of Hornsea in Yorkshire. We enjoyed the experience so much we are cycling from Manchester to Paris next year to gather further funds'. 17 year old Steph embarked on a 50 mile walk from Abbotsbury to Brownsea Island with 5 friends, as part of her Queen's Guide Award. She also decided to use it as an opportunity to raise money to sponsor the House Sparrow in Bird Atlas 2007-11. The group gained an incredible amount of support from friends,family, businesses and organisations along the way, raising £1600. Well done to them all for such a fantastic effort! Flicky and Howard cycled from Land's End to John O'Groats, following their own leisurely route over 9 weeks, to celebrate Howard's retirement. They camped along the way, covering 1369 miles of terrific scenery and spotted a total of 128 bird species but as Howard puts it 'things did get tricky and sticky but it was the knowledge that so many people were supporting us that kept us pedalling on'. Their efforts raised over £850! 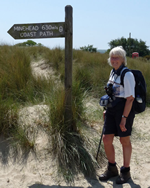 Chris Gunn, Lincolnshire North Regional Representative, set off to climb Kilamanjaro, a feat she had tried to complete many years before, and thought it was also a good way to raise some funds for BTO. She had lots of support and helped raise £280 but unfortunately, due to terrible and persistant rain, was denied the opportunity to conquer the mountain once again. Chris did however manage to climb Little Meru (12,535ft) the day before attempting Kili, with as she reports, no problems but little view due to thick cloud. A decision then had to be made - to continue or not for 7 days in a tent with no flysheet and a vast amount of rain? Chris chose the sensible option and was able to enjoy some of her holiday, despite the rain which continued to fall, by going off on safari, spotting 270 species of bird! We would like to say thank you to Chris for her efforts, and who also offered to reimburse any sponsorship herself so that BTO did not miss out, also to her sponsors for so generously supporting Chris and the BTO. If you are embarking on a challenge or would like to discuss a fundraising idea, please ring our Fundraising Team on 01842 750050 or email fundraising [at] bto.org.